Disclosure: For purposes of review, we received a discounted media rate on our room at Four Seasons Resort Hualalai. All opinions are my own. We absolutely loved our luxury family vacation at this resort. I didn’t even come close to experiencing all that it has to offer for families. We can’t wait to return in the future to share more about his amazing property and all that it includes for parents and kids. What’s your all-time favorite luxury family vacation resort, of those you’ve visited? As a luxury family travel writer, I hear this question frequently—far more than any other. And until recently, I struggled to respond because I’ve visited so many terrific hotels, each with its own unique offerings. However, after our recent family vacation at Four Seasons Resort Hualalai on the Kona-Kohala coast of Hawaii Island, I can confidently answer this question without hesitation. 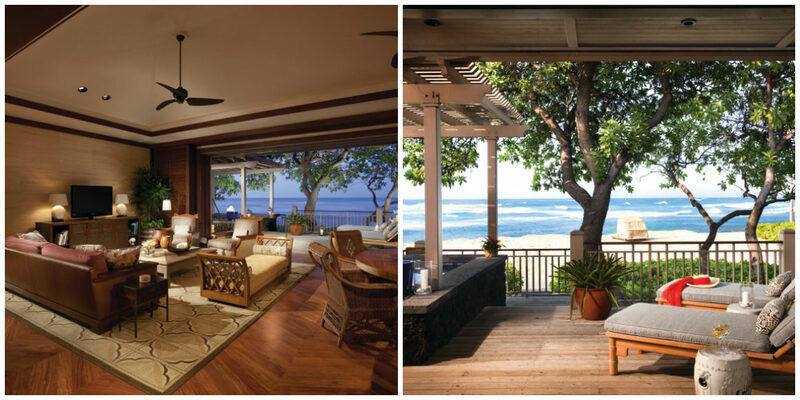 Yes, Four Seasons Resort Hualalai is that good. It now ranks as my all-time favorite luxury family vacation resort (and I’ve stayed in many amazing places). 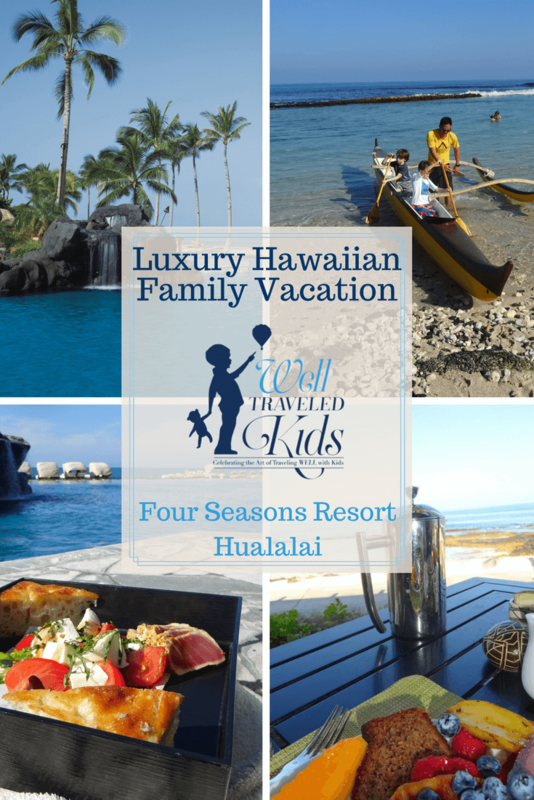 In fact, our luxury family vacation at Four Seasons Resort Hualalai was so good that if I could only vacation one place for the rest of my life, I’d absolutely choose to spend all of my future vacations there. 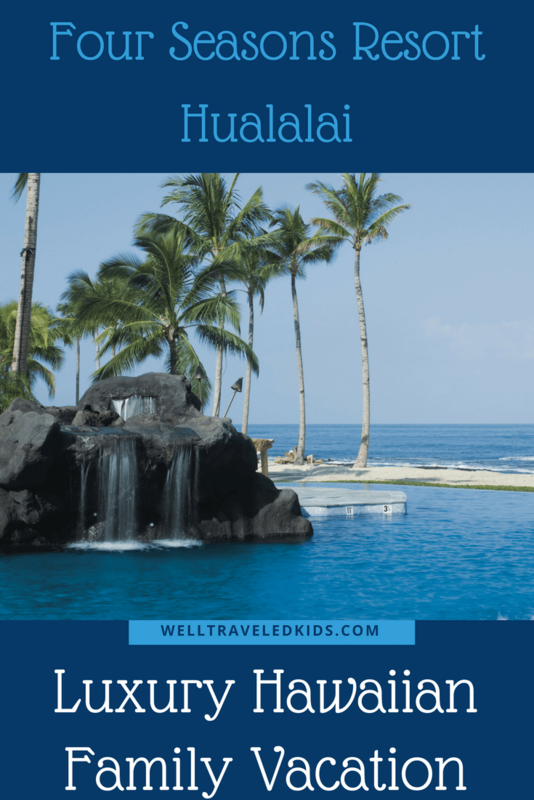 Read on to see why we loved this resort so much and why we highly recommend it to families looking for the ultimate Hawaiian luxury family vacation with the kids. We flew to Hawaii Island into Kona Airport at night. It was dark by the time we picked up our rental car, and as we drove through the private gates into the village of Hualalai, we couldn’t see much. However, the gorgeous manicured landscapes along our drive hinted that we were in for a treat. Friendly bell staff greeted us upon our arrival. They led us up the steps to the gorgeous Hualalai Lobby for our personal check in. Right away—met with delicious house Mai Tais and draped in gorgeous leis—we could tell that the service here would be outstanding. Next, our friendly bellman shuttled us to our deluxe ocean view suite. He personally carried all of our items (and we don’t pack lightly) up the flight of stairs up to our room and showed us around our spectacular accommodations. We immediately fell in love with the flow of the suite, including two huge bathrooms with amazing tub amenities and our enormous lanai overlooking the ocean. We felt right at home in our lavish family suite. On our very long airplane ride from Chicago to Hawaii, I asked my 6-year-old son Harry what he’d like us to be sure to see and do on our vacation. 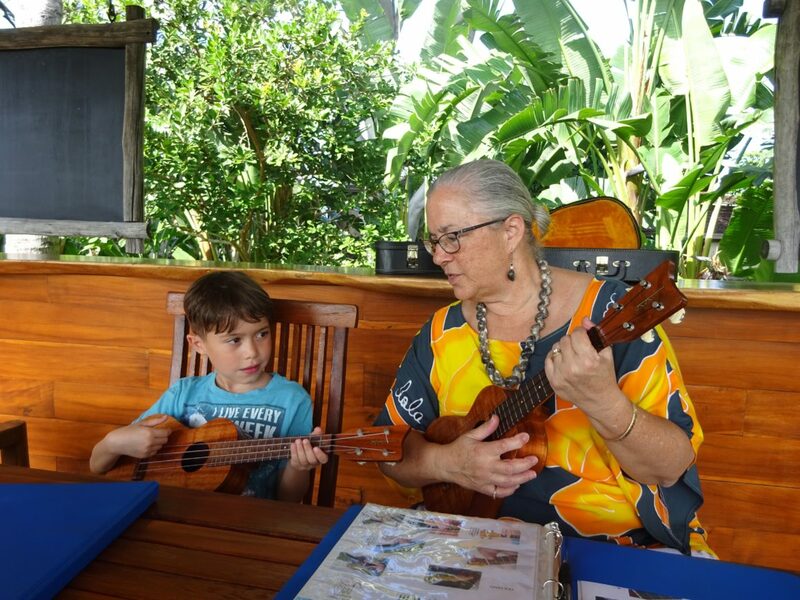 Harry had four major things on his Hawaiian vacation wish list: watch whales, snorkel with turtles and pretty fish, learn to make a lei, and learn to play the ukulele. Never did I ever think we would be able to cross all of those off on our vacation, especially while staying at only one luxury family vacation resort. 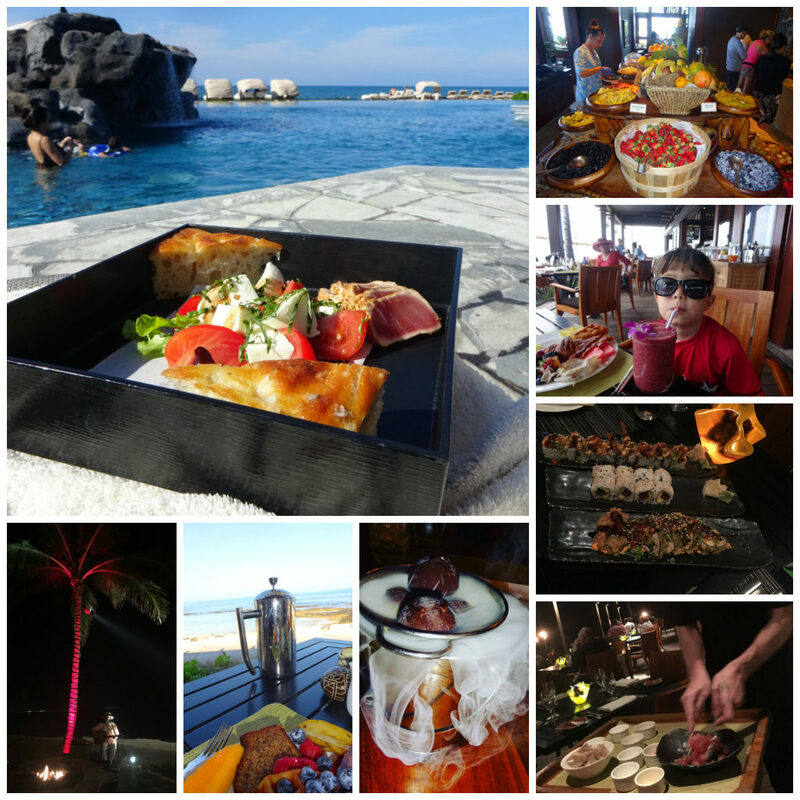 But we did all of that and more at Four Seasons Resort Hualalai. We woke up our first morning to spectacular surroundings. Anxious to explore, we started our day early to make the most of our our time in blue Hawaii. The resort offers a full schedule each day of adult and children’s programs. We started our morning in the resort’s Culture Center, where we met historians who were leading an early morning complimentary shell bracelet making class. We fell in love with Uncle Earl, who explained some ancient Hawaiian traditions while we threaded our shells. Harry had spotted a ukulele class on the list of classes scheduled during the week of our stay. I asked if I could sign him up for the class, but was told he was too young. However, the staff happily accommodated, offering to give him a little private lesson later in the day because he was so excited to learn. Next, Harry insisted we check out the kids’ club. Kids For All Seasons is the extraordinary complimentary kids’ club for Four Seasons guests. Harry immediately checked into the club, made friends, and had a blast. He loved it there so much that he wanted to spend every day of our trip in the kids’ club with his new best friend Rafferty. The two had a blast together day after day. 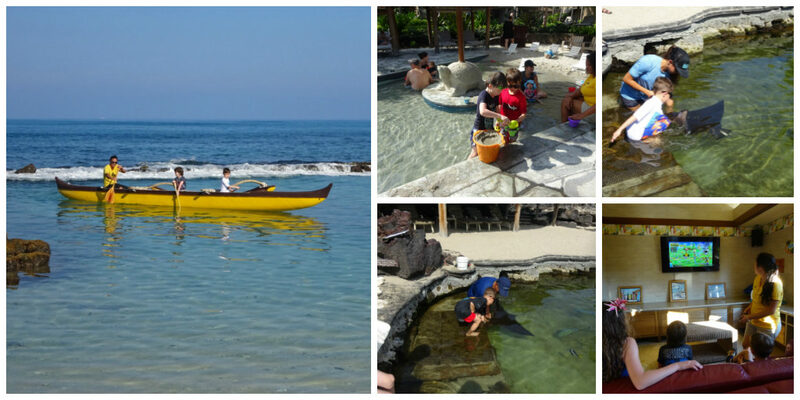 Each day, Kids For All Seasons offered a full schedule of incredible activities: learning to ride an authentic canoe; threading authentic Hawaiian leis out of orchids; daily feedings for Kainalu, the resident spotted eagle ray, with a resort marine biologist; feeding the 4,000 tropical fish in King’s Pond; splashing and swimming in the resort family pools; watching sea turtles sunning themselves on the rocks at the beach; scaling the resort climbing wall; and competing at video games. While Harry spent all of his days experiencing the joys of Kids For All Seasons with his new best buddy Rafferty, my husband and I found ourselves able to enjoy a romantic vacation-within-a-vacation during the day. We enjoyed heavenly breakfasts at ‘Ulu Ocean Grill followed by leisurely romantic walks on the beach. Through the rest of the days, we rotated between the resort’s three pools. My husband and I also share a love of snorkeling. So we were delighted to spend time snorkeling each day in King’s Pond with the 4,000 tropical fish. We timed our snorkels so that we’d be in the water when Harry and his buddies fed the fish. Harry really got a kick out of seeing us in our snorkel gear, and it was marvelous to see all of the brightly colored tropical fish swirling around us at feeding time. Each day, we ordered lunch poolside. The service and food were exceptional. We loved that each of the pools had its own poolside menu. And every hour, the pool staff came around with complimentary treats to cool us down while soaking up the warm Hawaiian sunshine. Harry and his pals would find us at the pool, and we’d watch them play together in the water for a bit before they headed on to their next activity. I’d take breaks and go take photos whenever I knew a unique activity was coming up. My husband and I were so happy and relaxed from our quiet island time each day. We loved the combination of having our own time and quality family time together at the resort. We ate exclusively on property during our stay and found all of the menus at each restaurant to be farm-to-table fresh with delicious choices for the whole family to enjoy. The breakfasts at ‘Ulu Ocean Grill are over the top amazing. Seriously, I haven’t ever met a breakfast spread I liked better in all of our travels. Lunches by the pool were light, fresh, and always tasty. Our favorites were burgers and an out-of-this-world ahi tuna caprese salad. Dinnertime at the resort gives you a chance to strut your fancy island casual attire. We fancied ourselves up for dinner each night and had a ball in each of the restaurants, enjoying our family time and the amazing ambiance and live music. Each restaurant was full of couples and families alike. The seating was spacious, enabling kids and families to have fun without bothering couples’ romantic evenings. We especially loved the classic italian dishes at Beach Tree Restaurant and haven’t stopped talking about the authentic Batik Room Bon Bons, circa 1964, that we devoured for dessert on my birthday. The romantic ocean front vibe of ‘Ulu Ocean Grill at night and the fresh sushi and sashimi feast, were adored while we savored our first table side poke experience. I absolutely recommend the Hualalai Spa as a must for hotel guests. I loved everything about my amazing hot stone massage in my private Hawaiian hut. My husband and I adored the co-ed, intimate spa relaxation gardens. We spent all afternoon there one day, snacking on complimentary treats after our incredible spa treatments and relishing the outdoor lava showers. 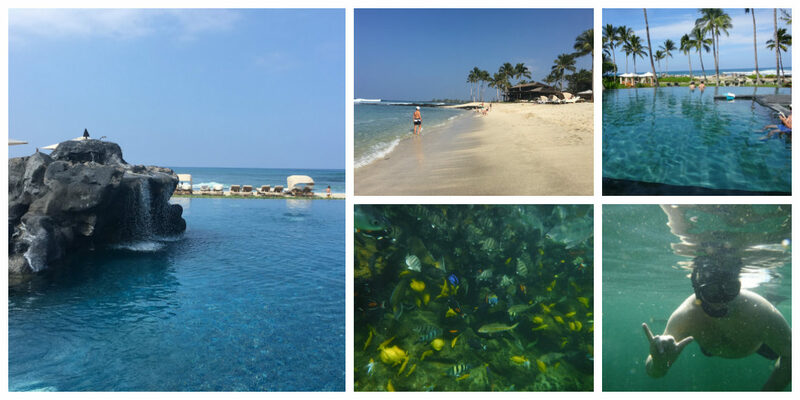 We absolutely cherished our luxury family vacation at Four Seasons Resort Hualalai, but we also made time to explore the breathtaking Hawaii Island. It wasn’t our first trip to the island, so we knew exactly where we wanted to explore again. With our own car, we drove a full circle around the island, stopping along the way. We made a day of exploring—first stopping in Kona to visit a coffee plantation and then strolling through the Pu’uhonua o Hōnaunau National Park. Next, we followed the island along till we arrived at Volcanoes National Park. 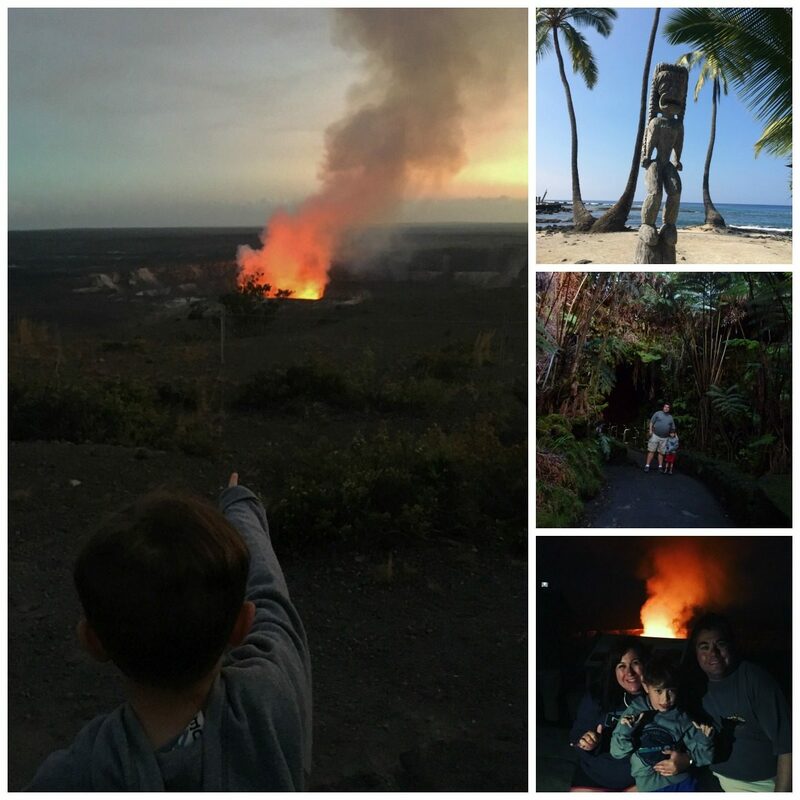 There’s nothing quite like watching the hot lava dance off the top of a live volcano at night while hugging your family—an unforgettable experience we will always cherish. We drove home over the mountains at night. One of my favorite memories happened as our car climbed up to an altitude above 9,000 ft. It was dark, and the stars were so bright that we pulled off to the shoulder of the road. We got out of the car. We stood in the cold air to see the hundreds of stars twinkle in the sky. The night sky was so clear that we had an amazing view of the Milky Way, too. Standing outside, peering up at the night sky in an area without lights, gave us a surreal feeling, as if we were so close to outer space. While we had a great time exploring on our own in our rental car, we appreciated that the resort’s knowledgeable concierge offers all sorts of sightseeing excursions and itineraries that they arrange for guests of the resort. It’s been awhile since we returned home from our stay at Four Seasons Resort Hualalai earlier this year. But I can close my eyes and picture every moment of each day of our stay perfectly. That’s how outstanding our experience was. We fell in love with every staff member, every unique experience and activity, every meal, and of course our gorgeous surroundings. I’ve already recommended this resort countless times to my friends and readers who ask me about my all-time favorite luxury family vacation resort. I will continue to sing its praises till I’m lucky enough to return again—hopefully very soon! Click the images below to save to Pinterest! Next Post Why Acqualina Resort & Spa Sunny Isles Beach is the Ultimate Beach Holiday!